Americans love potatoes, eating about 125 pounds, per person, per year. Although potatoes are easy to grow, many off-gridders on small plots of land avoid them because traditional growing techniques take up a lot of space. However, by using the caging technique, you can get a high yield in a small space. Caging refers to the practice of using a wire cage, wooden box, barrel, or any other device designed to grow potatoes vertically. By using this practice, potato yield can be increased by anywhere from two to 10 times using the same area of garden. 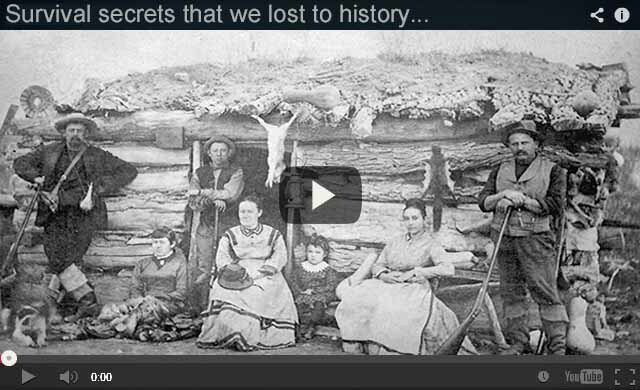 Discover the secrets that helped our forefathers survive! Select the container, or cage, for your crop. It should be 18 inches by 18 inches or larger, with room for 1 to 4 feet high of soil. On my homestead, I use either a 4-foot-square or 5-foot-square raised bed, constructed of wood, which is 16 inches high. There are also commercially available cages designed for growing potatoes vertically, but instead of spending your hard-earned money, I’m sure your off-grid homestead has materials available for constructing one. Before planting, set aside enough soil to fill the container. For potatoes, a slightly acidic soil that drains well is ideal. I like to use a mix of peat moss, native soil, compost and vermiculite. Fill the cage with 6 to 8 inches of soil. Plant the seed pieces 3 to 4 inches deep. Let the potatoes sprout and grow to a height of 8 inches or so. The photo above is from my 5-foot by 5-foot potato cage for this year, where I have Yukon Gem potatoes that have grown 6 to 8 inches high. Once the potato plants are about 8 inches tall, like in the photo above, it’s time to partially bury the plants. Take some of the soil you’ve set aside and gently bury the plants about a third of the way. I just did that in my garden. The photo here shows the potato plants after they’ve been partially buried the first time. Continue the process of letting the vines grow higher, and then partially burying them, until your cage is full. Take care not to ever bury the plants by more than one-third to a half, and make sure there is adequate moisture. Successful potato growing begins by selecting the right cultivar for your climate, and growing vertically is no exception. Potatoes originated in the cooler high altitudes of South America, and thrived for centuries in the cool weather of northern Europe and Ireland. So if you live in an area where the summers get hot like I do, choose a variety that has been developed for heat resistance. These include Butterfinger, Defender and Yukon Gem types. The reason caging works is that some varieties of potatoes will continue to form tubers from parts of the vine that have been recently buried. However, not all potatoes varieties are created equal — some excel at this and some don’t. So for growing vertically, consider those types listed above, as well as All Blue, Carola, Dark Red Norland, German Butterball, Yellow Finn and Fingerling potatoes. Potatoes should be grown on every off-gridder’s garden. They give great yields, provide lots of needed carbohydrates for the hard-working family members, and store for months without electricity. If you’ve shied away from growing them because of traditional space requirements, try caging today.